What’s It Like Living on a Yacht? For many people, a property with an ocean view is the most coveted type of property there is. No matter the season, gazing out into the vast ocean and watching the sunset can be a breathtaking experience. But have you ever considered what this view would be like from your own personal yacht? Probably about a million times more stunning! The tranquil, beautiful ocean views that a yacht offers are just a few of the many reasons why life is simply better on a boat. When you see a luxury yacht moored at your local marina, do you ever find yourself wondering what life on board is like? Simply put, it does not matter what type of yacht you’re on. Life on a yacht is purely what you make of it. Whether it’s an elegant Riviera 5800 Sport Yacht , a luxury classic Belize 66 Daybridge or the more modest, 20-year-old Bayliner 4788 Pilothouse Motoryacht life on the ocean is pretty spectacular if it’s freedom, relaxation, privacy, and memorable moments you are looking for. Life on a yacht is as calm and quiet as you want it to be, ensuring you have tons of time to relax and escape the stresses of everyday life on land. No matter the size or speed of your boat, you’ll be free from the constant hum of traffic, that annoying barking dog, and your neighbour’s noisy toddler. You’ll escape everything else you didn’t even know was stressing you out. Many yacht owners say one of the things they most appreciate about life on the water is how much privacy they have. When you live on a yacht, you won’t have to deal with things like unexpected guests popping by or keeping the curtains closed and the doors locked at nighttime. One of the things most yacht owners love is the freedom to pick up and go whenever the mood strikes. Yachting is the ultimate way to travel and explore the world from port to port to port. You’ll never have to sleep in the same spot twice, and you will finally be able to travel with that friend or relative who fears flying. Whether you do it for a few days, a few weeks, or you live on your yacht for years at a time, you’ll never forget the feeling of how special your time on the water will be. Life on a yacht makes for great photos, great conversations, and a sense of pride for the owner. If you’re looking to downsize and declutter, life on a yacht may just be the excuse you were looking for to sell everything off, pack up the rest, and go. 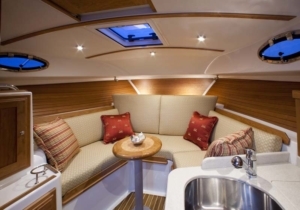 Wondering how you’ll spend time aboard your yacht? The possibilities are endless. Today’s luxury yachts offer modern kitchens, multiple bedrooms and living rooms, multiple sun decks, fitness gyms, modern kitchens, huge theatres, high-end sound systems, hot tubs, pools, and much more. You’ll feel like you’re on your own personal cruise ship. As we mentioned earlier, ocean views aboard a yacht cannot be beaten. While you’re enjoying all the above, endless ocean views surround you while you’re living life on your yacht. Before buying a yacht, spend a few nights on one to make sure you can handle life at sea. 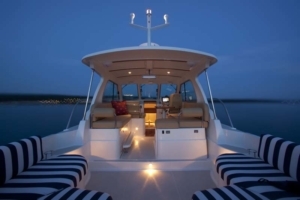 If you’re a light sleeper or are prone to getting motion sickness, a larger yacht will rock less during stormy weather. Talk with other yacht owners to find out what works for them. Research the resale value of your yacht if you plan on selling. Bookmark our blog for more tips! Questions about life on a yacht? Understanding the potentials of life on a motor yacht cannot be explained in one short article. If you would like to learn more about what type of yacht would be right for you, Van Isle Marina is here to help. Please contact one of our Yacht Sales Brokers or call us at 250.656.1138.